Aunt Mag is always getting lots of questions about "what kind of batting should I use?" Having tried many different battings and as a Longarm Quilter and having many different brands and types brought to us, I quickly realized that the batting makes the quilt! It is important to always remember that your batting is the foundation of your quilt. What you put in the middle affects how it looks, handles & feels after it is used. With so many choices to make it is important to make an informed decision and quality does count. 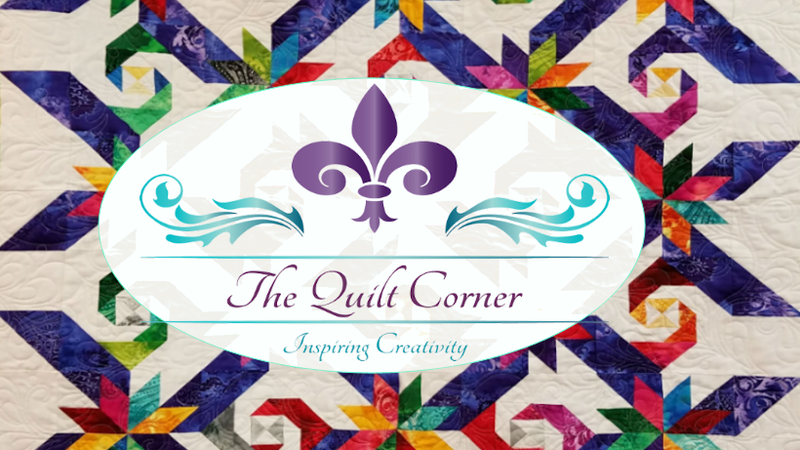 That is why The Quilt Corner only carries Quilter's Dream Batting. We have included a little information below about each type of batting we carry and what it is best suited for. So now you can say "I know what kind of batting I want to use!" Still undecided ... stop by the shop and feel the difference quality batting can made in your next project! 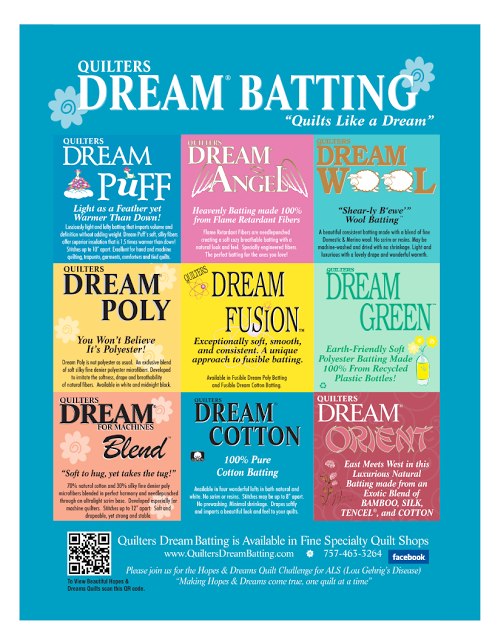 · Dream Cotton Batting – Dream Cotton continues to be the most popular batting of all! Dream Cotton is incredibly drapeable, beautifully soft, 100% natural, and quilts like butter! Available in four lofts, Dream Cotton is exceptional for all your quilting needs. Because of the natural, traditional fiber, Dream Cotton is recommended by the Restoration Society, but it is also great for today's modern quilts. We use a very high grade of USA cotton and the longest fibers in the industry. This is important because longer fibers mean minimal shrinkage, less bearding, and virtually no lint on your machine. The longer the fibers, the more places the fibers will intersect, making the batting so strong that you can stitch up to 8 inches apart! With our unique processing using no scrim, glues or binders, Quilters Dream Cotton remains soft, huggable, and beautifully drapey. Choose Request weight for hand quilting, Select for hand or machine quilting, Deluxe for machine quilting a heavy quilt, Supreme for machine quilting a very heavy quilt or craft projects. · Dream Poly Batting - Available in Request, Select, and Deluxe weights, Dream Poly is made 100% from polyester microfibers. The poly microfibers mimic the cotton so you get the same look and feel of the cotton. However, it has the benefit of no shrinkage, so it is perfect if you want to keep that “just quilted” look, even after multiple washings. Dream Poly does not hold a crease, so you can fold it and store it (or ship it to a show) and not worry about lines or wrinkles when you take it out. The request and select lofts are light, breathable, and drape beautifully. The high loft, deluxe, is perfect for wall hangings that you want to lay flat without curling corners, and will shows off your stitches wonderfully. · Dream Blend for Machines – Note here that this batting is “for machines” – it has a light scrim, so you won’t want to hand quilt this batting. However, because of the scrim, it is very easy to handle and work with, so it has become an all time favorite for the long arm machine quilters. You can tug it into place without worrying about stretching or leaving hand prints. It is slightly heavier than the cotton or poly, but the scrim is so light that it still has a very nice drape. · Dream Wool – This is a very soft wool that is very breathable and light weight with a nice loft of about 1/3 - 1/2” to emphasize the stitches (or hide those slight piecing imperfections). It is thermally bonded, so can be machine washed and dried (on cool settings) without much shrinkage at all. More and more people are telling me that this is their favorite, both for hand or machine quilting; they’ve convinced me – I’m going to give it a try on my next quilt. · Dream Puff – This is another batting with a very nice 1/3-1/2" loft - just enough for a slightly "puffy" quilt. It is made 100% from poly microfibers, and, like the Dream Wool, it is thermally bonded to hold the loft without being scratchy or stiff. It is soft, breathable, and very affordable. Dream Puff is a great all around snuggly modern style batting for quilts. Layer the Dream Puff with a Dream Cotton for a perfect faux trapunto - the cotton will shrink slightly when washed making the Dream Puff really "pop"! · Dream Green – Could a batting from recycled bottles be soft and snuggly? I was skeptical, but Dream Green proved me wrong. This batting is exactly the same as Dream Poly select, with the exception that the fibers were once soda bottles, and it has a green tint of color! If you are eco-conscious and going green, this is the batting for you - each pound of Dream Green batting rescues 10 bottles from our landfills. You won't believe anything this soft, cozy, and breathable could come from recycled bottles, but it is true! · Dream Orient – This is the softest and silkiest batting available. It is made from a blend of silk, bamboo, cotton, and botanic tencel that is simply scrumptious to work with. Your finished quilt will absolutely hug you. Beware – this batting is highly addictive! Wishing you a Quilty sort of Day!